I recently visited the Chuang Yen monastery again. The Thousand Lotus Memorial Terrace is a service Chuang Yen Monastery provides. 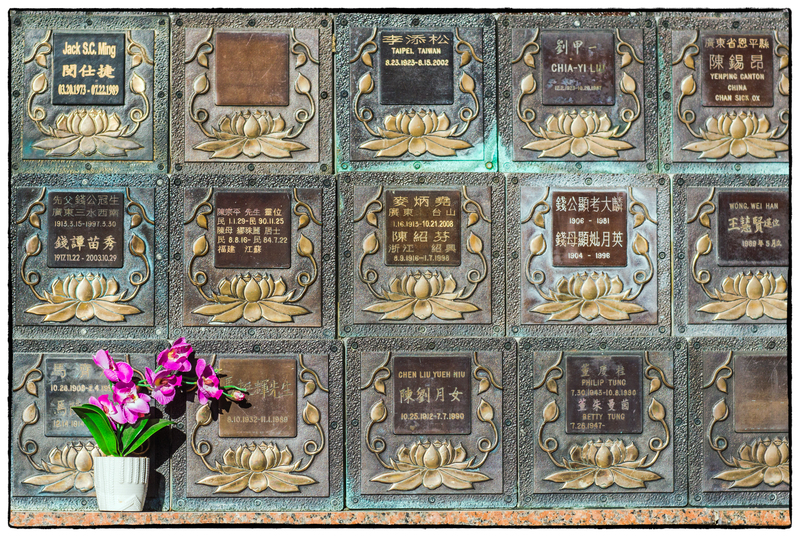 Twice a year, in the spring and autumn, there are ceremonies during which the ashes of the deceased are placed in the Thousand Lotus Memorial Terraces. In Mahayana Buddhism, being grateful to all sentient beings is strongly emphasized, especially to our parents. According to one of the Mahayana Sutras, we should be grateful to our parents, and also to sentient beings, the king or minister of the Triple Gems. They are our providers who also protect and guide us in every aspect of life. These memorial terraces, therefore, enable us to express our love for and gratitude to our parents, and to teach or show our next generation how to be grateful to their elders. There are two Thousand-Lotus Memorial Terraces situated on the northwestern slope of Chuang Yen Monastery. They face southeast and are built with granite. The half circle design and the statue of Amitabha Buddha which overlooks the terrace and symbolizes the Western Paradise in Pure Land Buddhism. I didn’t have a wide enough lens with me to capture the terraces in their entirety so I focused on the detail above. As a result of this I didn’t even notice the Buddha statue mentioned above. I’ll have to go back and have a look. Until I can get a few more pictures you can find some here.